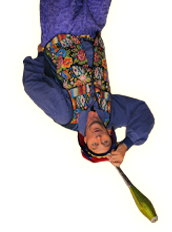 The Nicolo the Jester solo show is the centerpiece of Nicolo Whimsey’s offerings to children and family audiences. The 45-minute show is perfect for elementary school assemblies (K-5th grades) as well as pre-schools and day care centers, and emphasizes the joy in reading books, the thrill in writing and reading poetry, and the importance of values such as kindness, generosity, and tolerance. The Nicolo the Jester show also carries a strong message of perseverance. 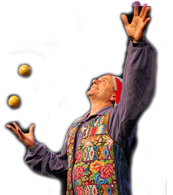 Nicolo keeps the students amazed with his formidable juggling skills, and laughing at his verbal and physical comedy, all the while participating by helping Nicolo finish his poems, and by spinning plates on sticks and balls on their fingers, while wearing funny hats. By captivating the childrens’ attention and sense of wonder, Nicolo shares his belief in generosity and tolerance with his original poem “The Art of Juggling Peace.” Nicolo’s “Story of Yimmee Gimme” encourages the enduring value of kindness and generosity, and he emphasizes perseverance at every step, as the audience urges him to “Try again, Nicolo” every time he drops an object. By the end of the show, the students have memorized the chorus to his poem extolling the joys of reading: “Look in a Book”. The Nicolo the Jester show can accommodate very large crowds in a packed auditorium, as well as smaller intimate audiences. Nicolo adjusts the material for each show to suit any age group from Pre-K to 6th grade. Nicolo has been performing the show for thirty years, and yet every show is fresh. His delight in performing, creating, learning and sharing his skills is palpable. The show is perfect for Elementary schools, libraries, Pre-schools and day care centers, Summer camps, after-school programs, corporate parties, and any event that calls for an uplifting children’s show with a strong message of literacy, tolerance, generosity, perseverance and the joy in learning! Click HERE for more infomation on how to book Nicolo the Jester today! In 1986 Nick Newlin and Joanne Flynn (“Nicolo the Jester” and “The Queen of Whimsey”) combined their wildly successful stage shows into a powerhouse husband and wife performing duo that has toured the United States, Europe and Asia for three decades, from the White House and the Kennedy Center Millenium and Opera House stages to small villages in Nepal. Everywhere they go they leave audiences laughing and amazed as they combine unbelievable juggling routines with wit, music, charm, and merriment. The Nicolo Whimsey duo is perfect for family events as well as adult audiences, and features the Queen of Whimsey’s mime and silent character antics, Chinese Ball and Umbrella spinning, virtuosic musical saw and accordion music, and uproarious audience participation. This show leaves audiences laughing and amazed, and the chemistry that Nicolo and Whimsey share together spreads until the audience members all grin from ear to ear. They can’t help it! Nicolo and Whimsey provided interactive strolling entertainment with colorfully costumed and interactive juggling, plate spinning, accordion and pennywhistle, for any event that needs a big splash of color and joy. Nicolo and The Queen of Whimsey enliven fairs, festivals, holiday events, corporate parties, and any occasion that calls for joy and jaw-dropping skills that Nicolo and Whimsey happily share with each and every attendee. The happiness and charm that Nicolo and Whimsey bring to your event will linger long afterwards: the smiles will stay on faces, and the happy memories will linger! Click HERE for more infomation on how to book Nicolo and Whimsey today! Nick and Joanne have taught thousands of children to juggle over the last thirty years, and their unflagging enthusiasm, patience, and joy in learning keeps students inspired to keep working until they get it! Nick and Joanne teach groups of 30 students or less from grades 3 and older to juggle scarves and balls, spin plates, walk stilts and develop lifelong learning and practicing habits that will cross over into all of their endeavors! Nicolo Whimsey believes in the special gifts that all children possess, and they bring with it a rigorous dedication to the intellectual and physical challenges that foster positive growth. We tie our shows and workshops to the curriculum while encouraging positive values, attitudes and work habits. At all times, Nicolo Whimsey keeps it light and funny, because what is life and learning without joy and laughter?